North American box turtles are mainly terrestrial turtles, although they do spend some time in shallow water (Asian box turtles tend to be a bit more aquatic). Compared to aquatic turtles such as red eared sliders, they are more challenging and complex pets, and are not the best choice for beginning turtle owners. With a potential life span of up to 100 years, these turtles obviously require a long term commitment (however, the average life span of captive box turtles is probably closer to only 40-50 years). Try to find a captive bred turtle, as wild caught turtles tend to be stressed, dehydrated, and prone to disease as a result of their stress and environment during capture/transport. In addition, support of the wild catch/pet trade in box turtles may further threaten their numbers in the wild (and taking in native turtles is illegal in many states). An alternate source is shelters or rescue groups. Find a turtle in the late spring or summer months; it is best to avoide purchasing a box turtle during the fall or winter when it should be hibernating. Make sure the turtle feels "solid" (i.e. not like an empty shell), and has clear eyes and nostrils and a firm, solid shell, and no swellings. It is wise to get a stool sample checked by a veterinarian and deal with any parasites, and take the turtle to a vet immediately if it is not eating shortly after arriving home (it may need rehydration). Also keep in mind that box turtles, like other reptiles, can carry Salmonella so careful hygiene is required during handling of turtles and cleaning their enclosures. A well designed outdoor pen, providing appropriate substrate, humidity, access to water, and protection form predators will work well in appropriate climates (generally speaking, this is probably limited to areas where box turtles are indigenous). Given an appropriately sized enclosure with provisions for heat, humidity, and lighting they can be kept successfully indoors. An indoor set up will require considerable planning to provide a land and water area, a heat source (under tank), a basking light and a full spectrum lamp (important for Vitamin D metabolism). A varied diet must also be provided. Box turtles are omnivores, but different species and different aged turtles tend to have preferences for either more animal protein or more vetation in their diet. 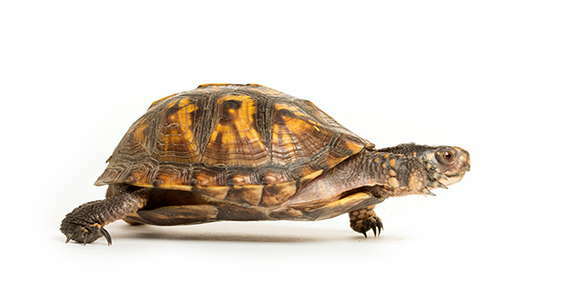 For example, in some species of box turtle are more carnivorous than adults. They must be feed a variety of foods from both groups including plenty of fresh vegetables and fruits, insects, low fat meats, pinky mice, and other foods. North American box turtles hibernate and this complicates their husbandry somewhat. Appropriate conditions must be provided sheets for hibernation with a warning that turtles that are not in good condition/health should not be allowed to hibernate as they will not have the reserves and strength to survive. Do everything possible to ensure good health prior to the time of year that hibernation should begin. For unhealthy animals a period of hibernation, when all bodily functions slow considerably, hibernation will only make health problems worse, if not kill the turtle.